Built at the turn of the century, TREETOP INN has been lovingly restored to provide modern comforts in a 1900's setting. 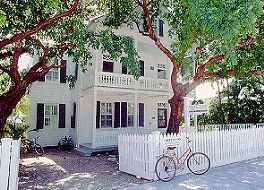 This National Historic Register bed and breakfast received the 1994 Key West Chamber of Commerce's "Business for Beauty" award. Located in central Old Town, guests can walk to Atlantic beaches, Gulf sunsets, fine restaurants, art galleries and shops. A delicious, complimentary breakfast is provided on the deck. Guests can relax by the pool and enjoy the beautiful tropical setting provided by the lush tropical garden. Balconies are available for reading and relaxing. Guest rooms are spacious and are furnished in wicker and antiques. Rooms provide either a king bed or two full beds. All have private baths, air conditioning, cable TV, phones and ceiling fans. All rooms are light and airy, beautifully appointed and are a perfect setting for your Key West vacation. This and other Key West Bed and Breakfast Inns can be found here in The Register. Romantic Country Inns, Getaways and B&Bs offer a great Key West lodging alternative to big hotels.